In November of 2014 I covered Marika Takeuchi’s album Rain. Here it is April 2016 and the latest release from this most talented pianist and composer titled Colors in the Diary is now available. Her 4th album is produced by the Grammy-winning producer Will Ackerman and features the world-class cellist Eugene Friesen and violinist Si-Jing Huang. Even though the piano work is good enough to stand alone the addition of these two musicians most certainly accentuate every note produced by the ivory keys. The colors that populate this lady’s world are what surrounds us all, the beauty of Mother Nature. And through her music Marika paints a most lovely picture and goes from strength to strength to record a solid album. With winter disappearing and the spring bringing warmer weather “Frozen Lake” was a quick reminder for folks that experience one of the four seasons. The elegance of Marika’s playing was like watching an ice ballerinas perform on the local lake. It was like a private performance from entertainers, one real and the other imagined thanks to the music brining it all to life. As “White Mountains” come cascading down through Marika’s talented fingers you use the music as a bridge to the great outdoors. Like an avalanche of emotions, I could imagine looking out my window or driving by to see the beauty and strength of the mountain that sits protecting our beautiful valley. To see something so awesome every day and to watch the changing seasons from afar seems more prolific than seeing it up close, it almost surreal at times yet always appreciated. The two most important elements of this recording, classical and new age merge to create each piece like it was an individual painting. I think the cover puts that very thought into proper perspective. With tracks like “Remembrance” the cello comes in and creates a longing or sadness if you will. This however is not a negative; it is very meaningful and purposeful. As Marika lets the cello set the tone she introduces a very pragmatic melody and this creates a more upbeat and reflective mood. Remembering a place, person or special day in one’s life comes to mind. This is a very powerful word and so is the music to make it more so. 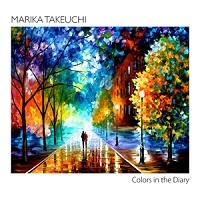 Marika Takeuchi and her music befit the title of the album Colors in the Diary. The colors are hers but they belong to those that listen to the music at any given moment in time anywhere on earth and certainly easy to relate to for anyone who appreciates and respects the wonders of our natural world. So let this talented lady invite you to paint your own picture and color it with what you will…the colors of life, the outdoors, your emotions, whatever color you are feeling, the music lets you go there. This music is perfect just like the nature that surrounds us and you don’t have to look far to enjoy it.